Restore and refresh your mind and body as you explore Florida’s Forgotten Coast of the Panhandle Big Bend region! Experience Florida’s rich biodiversity at a leisurely pace. Lesley Cox of Les Hassel Excursions is dedicated to raising environmental awareness with positive direct experience as she guides you through North Florida’s natural habitats. It is Lesley's goal for you to have the most memorable encounter with nature as possible. Let us help you select the excursion that is right for you and leave the rest to us. Explore with a half-day guided walking or driving tour, hike all day, or plan to camp over night. The Coastal Bluff Trail, four miles long with two trail heads, provides a moderate hike through scrub habitat, sand pines, and relic dunes. Wetland portions of the trail hold water during the rainy season. Tate’s Hell State Forest is home to a large population of Florida black bears, red-cockaded woodpeckers, and bald eagles. Bring hat, sunscreen, and bug spray. Don’t forget your binoculars and camera. 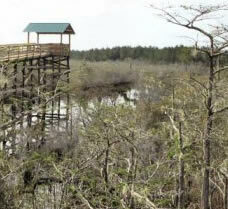 The Ralph G. Kendrick Dwarf Cypress Boardwalk is worth the 15 mile drive on logging roads to view the “hat rack” cypress trees from the bird’s eye vantage point. Along the way, depending on the time of year and time of day, chances are good a deer, bobcat, bear, or wild turkey will cross the road in front of us. Next, travel to pine flatwoods to view red-cockaded woodpecker trees. Then, on to a wet prairie savannah to see carnivorous pitcher plants. Finally, we will visit the New River at the Gully Branch Recreation Area for a rest stop before returning to Carrabelle. For either, the walking or driving tour, we feature wildflowers that are abundant in April, July and October. About Your Tour Guide: Lesley lives and works along the beautiful Forgotten Coast. She professionally guides individuals and groups through this unique part of north Florida specializing in tours into Tate's Hell State Forest. She is a Certified Green Guide (2006), a Florida Master Naturalist (2005) and a Master Wildlife Conservationist (2005). Lesley has past extensive experience working in the back country as a trail cook and a contract fire crew member. She has served on the Boards of Directors for local environmental organizations and stays active in community outreach. She often hosts numerous travel writers on a variety of outdoor adventures.